We’re super proud and super thankful for everyone who made this happen! Making the Moment Photography is proud to announce our acceptance of the 2012 Bride’s Choice Award from Wedding Wire and Martha Stewart Weddings. This represents the second year in a row we’ve won the award, and we’re so excited for it. As proud as we are of the creative wedding photography that made this happen, it was our client’s praise and efforts that made this award possible. Seriously – thank you to our numerous brides and grooms who took the time to write and share their praise about our hard work and creative efforts in preserving their wedding day. It has been such a sweet pleasure serving you all, and we’re so thankful this happened. 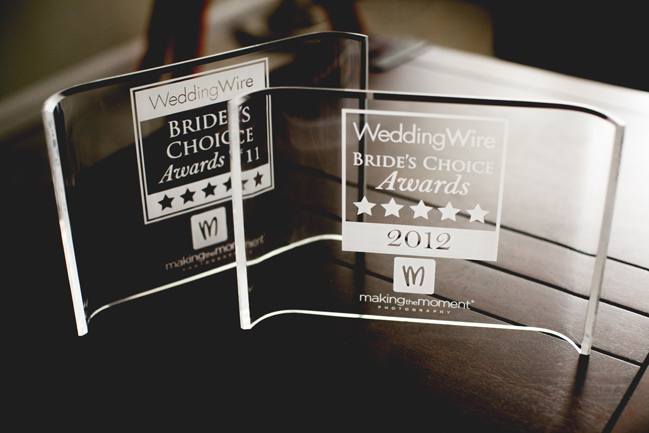 If you haven’t yet seen the praise of our past bride’s and grooms, please check out our profile page on Wedding Wire. You’ll see the kind words and the sweet feedback our brides and grooms had for us. They are all legitimate and authentic reviews, and are all people we care very much about. Congratulations to an awesome team of photographers!